It all began when someone called Harrison Owen noticed that the best learning and best conversations at most big conferences and events were happening in the coffee breaks. Oh dear. And so, a whole new way of working was born. Now groups of dozens or hundreds can be supported to manage their own agendas, to prioritise what they need to talk about most, to make the most of their own resources and to record what needs to be recorded. The potential of systems and networks can be unleashed. And yet, we still seem to be addicted to running events with experts on the stage, telling us stuff that we could have found out from reading their books or websites and then people in the audience asking questions that for the most part aren’t questions at all, but rather statements of how clever they think they are. Why do we do this ? Shouldn’t we know better ? If you want to explore the freedom and creativity of Open Space, then get in touch. Why not let people choose the conversations they have for themselves ? 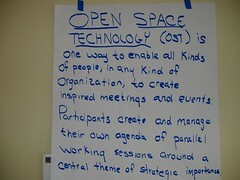 I just been made aware of Open Space Technology and would love to see it in action – any idea where/when sessions in Ireland might be? Thank you for your query. Great that you are interested in Open Space. I’m planning a series of days around Ireland incorporating Open Space and World Cafe to give lots more people a taste of what these ‘living systems’ methods are like. We’re piloting this next Monday, (unfortunately for you in Oxford) under a question of ‘how can our communities be the best they possibly can be ?’ – I hope to post more about this next week and then we’ll start putting some dates in diaries.